Some days after the closing of ManiganSes – Festival International des Arts de la Marionnette in Saguenay, Quebec, the emotion of the global experience is still alive! As Éric Chalifour stated (see this interview), it is not only a program of shows, but rather a frame for many activities deepening in one specific emotion —this year was the fear, but not only—, expressed through plenty of forms. In its last block, ManiganSes continued the exploration of outer territories between the objects, puppets and actors’ bodies, and raising up quite misterious emotions. One of the shows that put on stage a successful mix of languages was ‘Strict Minimum’, by the local company Théâtre à Bout Portant. Vicky Côté is the creator and manipulator of this delicious play, and she is also dancer, so she easily expresses herself by using the codes of this scenic art. Very few puppeteers can play a show so close to gestural theatre being so much natural as her. Côté made a show based on her own body, its movement and a little character that gets out of it and claims for a personal life and the control on the relation between them. The modern subject of the puppeteer dominated by her puppets is the main conflict of the first part of the performance —that finishes quite after a funny intermission. She creates expectations, breaks the rhythm and finds herself doing absurd and hilarious positions. A little animal made of a wool glove is contesting all the time the body of the actress which it depends on. At one point, when this situation seems to be over, a new story begins. Vicky Côté stays no longer at the foreground. Another glove-animal appears on stage (on her left hand) and the drama focuses on their little and very human story. The Compagnie S’appelle Reviens, from France, performed another one of the very inspiring shows of this edition: ‘Y es-tu?’ (‘Are you there?). This is a big production of shadow theatre that leads the audience into the mysterious forests of children’s fairy tales. A grandmother in the middle of the stage, in a penumbra, tells about the animals and the unknown around. The show does not cause sorrow or scare the children —it is rather a comfortable dream. The story travels at the rhythm of the live music played by a bass, the whispers of the musician and the questions and advices of the old woman. A girl from the audience was sitting during all the performance in a front corner of the stage, listening carefully, as an essential character of the play. 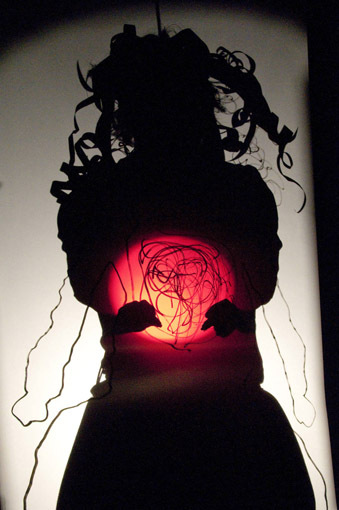 ‘Y es-tu?’ is the explosion of an inner world, the result of the research of Alice Laloy in several directions: technically, it is a complex production with many different projections and effects, the drama evolves at a level beyond common senses (so she really takes the best of shadows) and the storyline follows free paths towards children and grown-ups introspections. Among the featured shows that were played outdoors, still ‘La Femme Blanche’ (‘The White Woman’), by Magali Chouinard and ‘Le Poppetscu!’, by Belzébrute. ‘La Femme Blanche’, is, again, a show that appealed to senses more than rational comprehension. As Chouinard arrived to puppets coming from arts, the whole conception of the show is based on its visual impact. Using a mask, a totally white woman builds a world around her, made of totemic figures (tree, moon, raven) and human-scale characters (daughter, dog). She literally flows in this reality, and that’s how she gets a very special and amusing cadence. A completely different rhythm of ‘Le Poppetscu’, a crazy representation of a couple of street puppeteers who tell how insects die —and they do it very funny! So if in the first part of the Festival we could see different shows that required a certain level of knowledge (read the chronicle here), in the second block both artistic director, Éric Chalifour, and the audience, could free themselves into emotional performances. I just regret not having had the time to see shows as ‘La ville en rouge’, by Théâtre du Gros Mecano, Théâtre Pupulus Nordicus and Théâtre Populaire d’Arcadie, considered one of the highlights of the Festival; or ‘Münchhausen’, the closing show by Les Machineries de l’Immaginaire; or ‘Plastique’ by Puzzle Théâtre. He is linguist and writer and works in cultural journalism. He has been in charge of publications such as 'El Tacte que Té' (coeditor) and 'Zirkolika'.